Halo therapy treatments combined with Chromotherapy. Our 2x3m wall is made of salt bricks from the Himalayas dating from approx. 1.5 million years ago. In the northern region of Pakistan, powerful tectonic movements gave birth to the Himalayan massifs by raising the salt closer to the earth’s surface, between 4m to 600m deep. Sheltered from all atmospheric pollution, the quality of this salt is intact. It is pure, healthy, nutritious and rich in iron, which brings up its pink color. Your body will benefit from the 80 types of minerals and trace elements that’s contained in our salt wall. 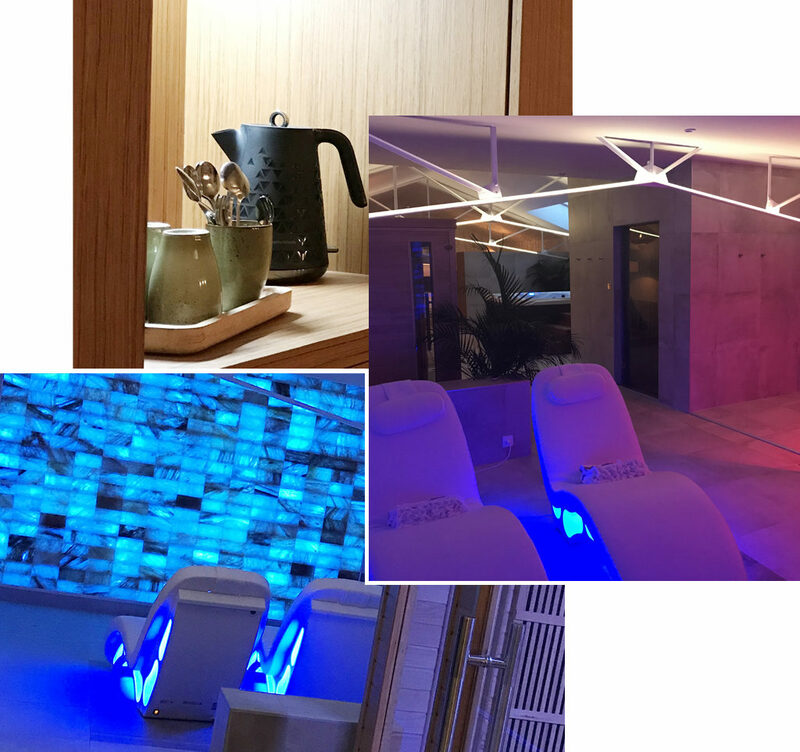 Our sensory shower awakens your senses by playing on different therapies: hydrotherapy, chromotherapy, light therapy, music therapy, aromatherapy, etc. Perfect in addition to a session of Hammam! This very wet steam bath has become a beauty ritual for Maghreb women because it softens the skin and releases body toxins. Your muscles will relax in contact with water and heat. Eucalyptus steam is also very effective for respiratory problems. Remember to cool off under the mist of our sensory shower! Our infrared sauna diffuses a dry heat which is much less stronger than the heat of a traditional sauna. If you cannot handle high temperatures, the infrared sauna is the ideal alternative. The benefits of the infrared sauna are multiple. Infrared rays accelerate cellular functions causing an increase in blood circulation, improve the cardiovascular system and strengthen the immune system. It is recommended to eliminate toxins, reduce stress and fatigue and you’ll enjoy a better sleep. 5 ergonomic seats including 2 lounge seats. 1 “Master Lady” berth, place intended for the female morphology to avoid the flotation phenomenon. Water temperature is at 36°C / 96.8°F and stirred by 98 jets of water and bubbles for total relaxation. Leg massage tunnels on the elongated squares. Dome massage low point for feet massage. Hydromassage reduces the pressure on the joints. The jets massage the muscles gently to eliminate toxins and activate blood circulation. Extend the moment by enjoying a hot drink in our Tisanerie. We offer a selection of teas and herbal Damman tea.